We've taken all the advantages of the more expensive pea shellers and made them affordable for those with small gardens. It wasn't easy, but we didn't sacrifice any important features. First, we wanted to make the rollers adjustable. The inexpensive fixed-roller shellers often mash peas or are hard to feed. Being able to fine tune the rollers made a huge difference! Now with a simple turn of a couple of screws, adjustments can be made for purple hull, black eyed peas, and even butter beans. Our rollers are specially designed for strong gripping power that magically tears the hull down the seam. Just because the PoBoy Pea Sheller is affordable doesn't mean it's cheap! Our rollers will last 7 to 10 years under heavy residential use. Even better- they're replaceable! No mashing peas? Yep! 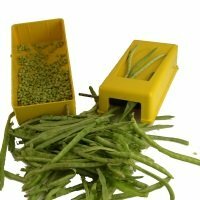 Our "Gripit & Ripit" system grabs the pea hull and rips it down the seam like shelling by hand, gently depositing the peas in the container below. Since the peas fall out the side like paratroopers rather than being beaten into submission like the tumbler pea hullers, there is no bruising and no trash to clean out. No mashing means higher yield. Just because you're only doing 5 or 6 buckets doesn't mean you can afford to waste them by mashing or the pea hulls not opening up. For less than $15 (or maybe even what you already have in your kitchen! ), you can have all the power you need to easily and automatically shell 2 bushel of peas or beans an hour. WOW! Clean up is a snap! Just run it under the kitchen faucet and you're done. No more complicated than that. Our rollers clean up just like new. We shielded the rollers, front, top & back to prevent fingers and hair getting caught. We've tried to make it as safe as possible. Of course common sense is required when operating any type of machinery. Shell purple hull peas in record time and with ease. Also butter beans and lima beans fly through the PoBoy Pea Sheller with professional results. Where Can I Get One? Your Help Is Needed! It will be available next year. What we need you to do is let us know you're interested. Please sign up at PoBoy Pea Sheller Website for the latest information and discount pricing.